Yes we can hear the thunder and water running. It will be a long day with the rain gear on and walking on country paths. No pictures while walking in the rain. I forgot to mention that C got bit by a bee or something the morning before last. Her fingers swelled up and she had to take her ring off. She took an antihistamine as well. No end of issues to deal with. We are here with the mother Teresa of Siena, sister Genetta. 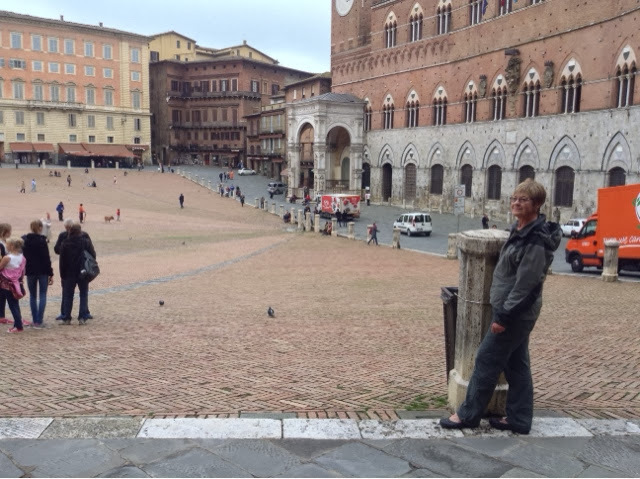 We arrived in Siena about noon and here around 1pm. We left at 7:30am in a thunderstorm with lightening and even some wind. The muddy water was pouring down the roads and paths. In no time our boots were inundated with water and we ended up just walking right through everything. In the dark it was difficult to find the trail markers but overall it was adequently marked along the way. The rain abated around 11am and if it wasn't raining so much, it might have been a nice walk. There was quite a bit of up as we approached Siena so along with the weather, we were all in when we got here. We had the exact address and name of the place we were coming to on a piece of paper. We approached a nice police lady and she brought out a map and showed us where it is. Navigating in these cities can get awkward when the street names are on buildings. We were standing on the street, when a man approached us and asked if we were pelligrinis? When we replied yes, he indicated that we should follow him. He led us right to mother T and she took us up to a dorm room. It reminded both of us when the night before there was a knock at the door and two very tired pilgrims were only too glad to be asked in. Now it was our turn. We had doctored up C's feet last night by draining a blister and getting them ready for this morning's walk, but I am afraid all that water undid any good we might have done. We came by some interesting castles today and they had write ups on their history outside on displays. The one small castle was built in the 14th century and was noted in 1555 that it held off invading French troops for an extended period of time. These cities and areas seemed to have been at each other's throats for centuries. The way the castles and fortifications were built for the best strategic advantages. One of the two USA college students who volunteer here, came and got us and we had lunch together in the dining room. 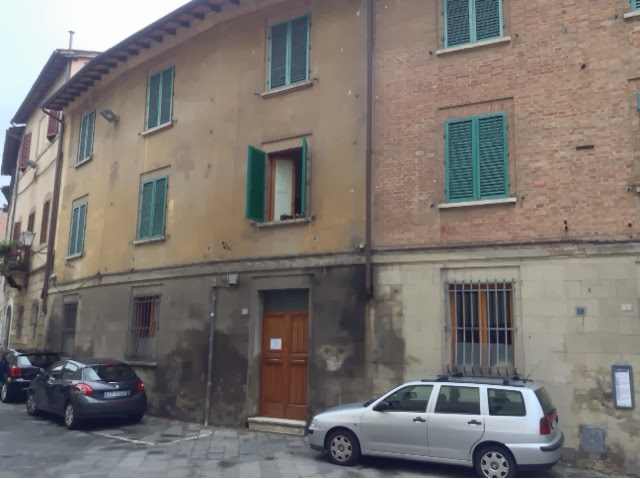 The students live with an Italian host family and their classes are taught in Italian. They go back to the US in December but are obligated to put in 15 hours every week of volunteer work. We received an invitation to have dinner here at 8:15pm and we accepted. Got company this afternoon, the same couple we let in last night, showed up here. It's a little chummy but we will get through it. They speak only Spanish and started walking in Lucca and are going to Rome as well. He showed us their credentials with the stamps in them. 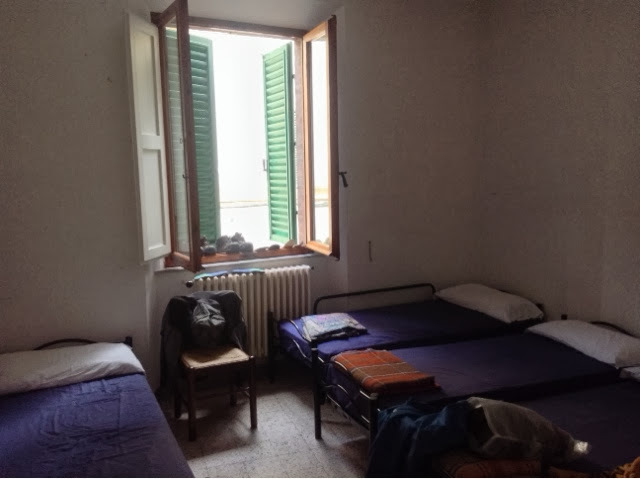 We have been going over the possible accomodations for the November 1 weekend which is a big holiday in Italy. This process is always a little frustrating because we have to list each town and at least one or two places in case one doesn't answer or is closed or or. I sat in that very square when I was 23. 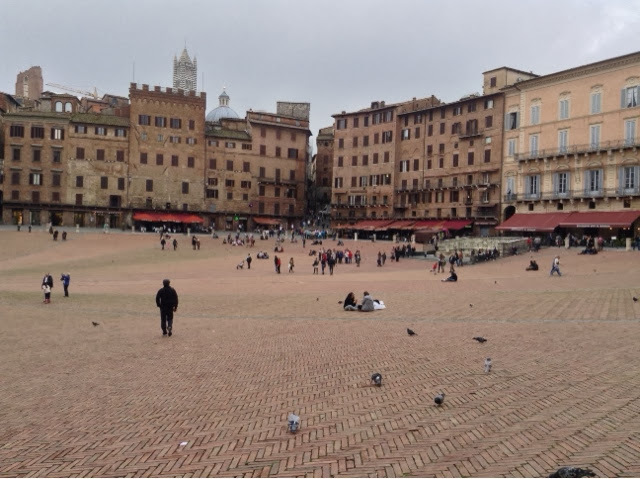 I remember sitting in that far corner with my backpack, taking an orange out of my bag and accidentally dropping it, and watching it role all the way down tot he bottom of the Piazza. I must have sat in there for hours watching all the comings and going and action.